Who says you have to leave the city to smell the roses/lick some sculpture/whatever you're into? These urban spaces are thoroughly ensconced within their respective concrete jungles, but so well designed that you'll wonder why you ever sat in outbound traffic. Summer is here and it's time to get outdoors -- and these are looking good. For most of us, college is marked by bad ideas. Not so for Georgia Tech student Ryan Gravel, whose 1999 masters thesis was the original proposal for the 22-mile transit gateway, the Atlanta Beltline -- one of the most ambitious urban renewal projects ever undertaken. 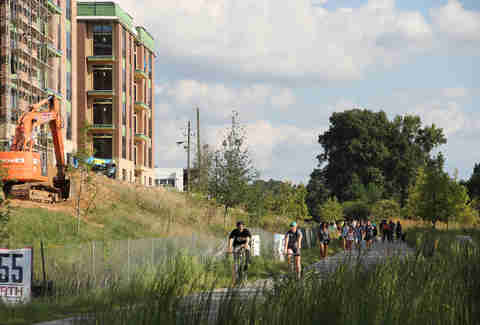 Where once there were disused railway tracks and garbage, Atlantans now enjoy four trail segments, four parks, affordable housing, shopping and amenities within the seven miles completed so far. By the $4.8B mark, the Beltline will connect 45 Atlanta neighborhoods with a network of trails, parks and a light-rail system. Which is all to say that this is going to be really hard on Ryan’s college roommate. 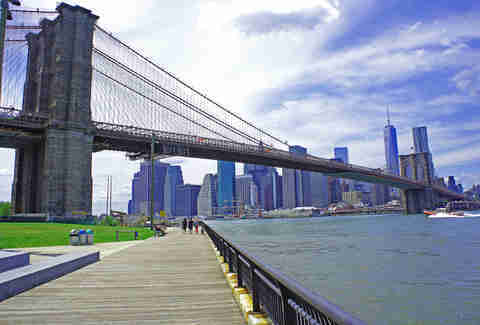 Recollections of when New York was seriously sketch usually involve a mention of shady dealings at Brooklyn Waterfront, where abandoned warehouses and factories became a haven for crime post-deindustrialization. 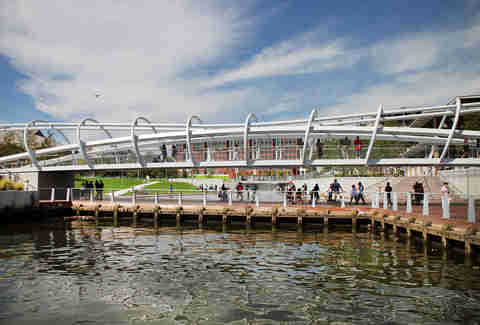 These days, it’s an 85-acre urban oasis, spanning 1.3 miles along the East River’s edge. 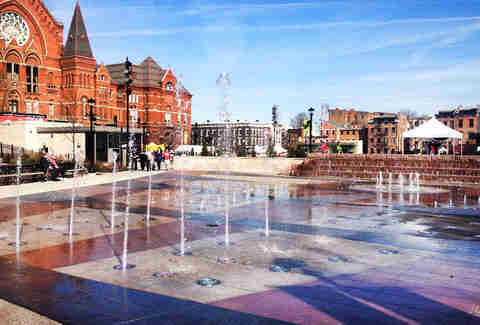 Its green spaces include playing fields, sports courts, playgrounds, lawns, a roller rink and boat launching site, and there are plans to integrate two historic properties, the Civil War-era Empire Stores and the Tobacco Warehouse, into the site. These days? The biggest danger at the waterfront is being jostled by a kid at the antique, year-round fixture, Jane’s Carousel. 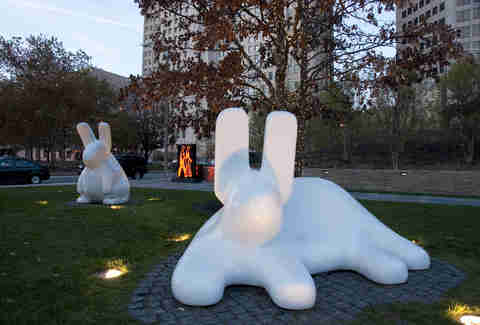 Before its conversion to an urban garden and sculpture park, Citygarden’s three-acres of boring old grass, between Eighth and Tenth, and Chestnut and Market Streets, was exciting only to grazing cattle. 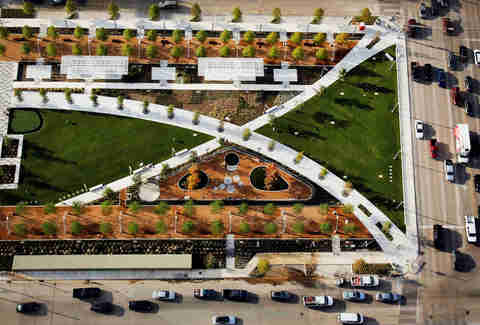 It’s now a public sculpture park, divided into three Missouri-esque zones, each with an appropriate defining ecological feature – the Upland’s 500-foot-long wall of Missouri limestone, the Floodplain’s spray plaza, and the Lowland’s regional plantings. 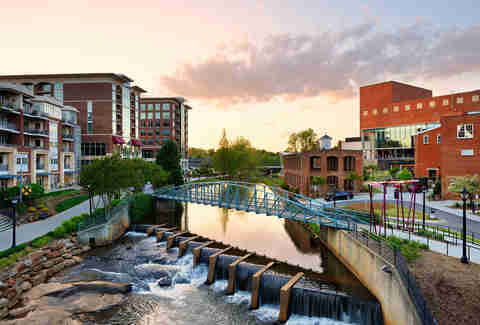 With its scenic overlooks, nature trails, pond, landscaped gardens, waterfalls, and 355-foot-long, curved pedestrian suspension bridge, it’s hard to believe that Falls Park on the Reedy River was practically a dumping ground a decade ago. 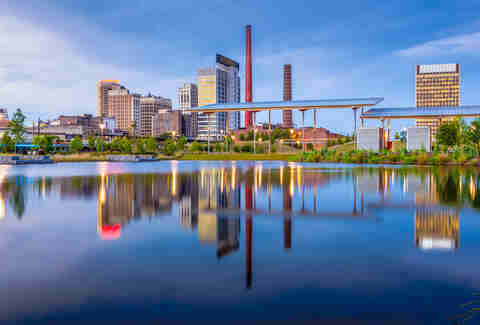 Its transformation began with the scrapping of the Camperdown Way Bridge in 2004, as part of a 32-acre master plan that cleaned up the river and kicked off the wider revitalization of the surrounding historic downtown. You shouldn't drop litter anywhere, but you double shouldn't drop litter here. Do you know how many cigarette butts they just cleaned up!? 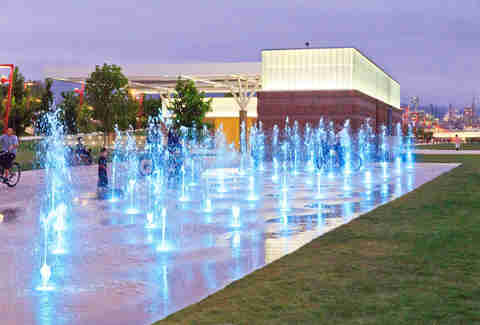 Located in the heart of Tulsa’s Brady Arts District, Guthrie Green went from an industrial patch of blah to an urban garden and performance space with a stage, pavilion, tree-lined paths, artsy structures for shade, water features and a large lawn. It regularly hosts markets, as well as concerts, theater events and festivals by touring and local artists. It’s not just green to look at either: LED lighting and solar panels reduce electricity needs, and a geothermal well field on the park site feeds ground-source heat pumps at the neighboring Tulsa Paper Company building and keeps the earth at a perfectly splay-worthy 66 degrees. 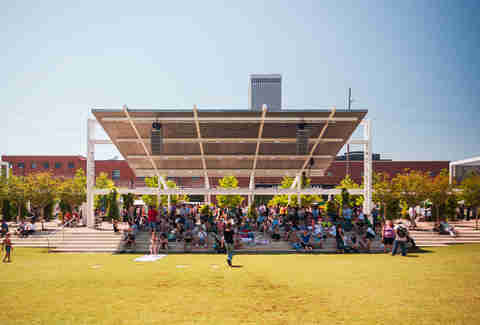 Once a weed-ravaged eyesore, Birmingham’s 19-acre Railroad Park now boasts nine acres of open lawns, a natural amphitheater, a 2-acre pond, and a series of undulating trails that will make that 3/4 of a mile loop feel like a lot more. If you really want to hit it hard, check out the Muscle Beach, California-style outdoor gym equipment. Or… you could always just sit in the grass and enjoy that free WiFi. Up to you. 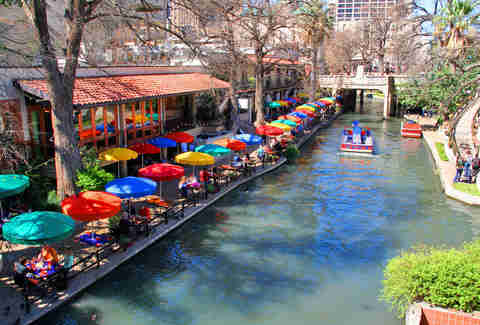 Though San Antonio’s most famous tourist attraction is not new -- its first restaurant, the still-operational Casa Rio, opened in 1946 -- a recent expansion added a beautiful new dimension to the riverwalk, over eight miles of reclaimed waterways. What was once a Soviet-style, concrete-walled flood control channel (fun!) is now a four-block-long pedestrian connection, punctuated with bridges and planters, between the historic Spanish missions south of city center and the historic Pearl Brewery complex. Because in all forms of exercise, it's good to have an end goal. 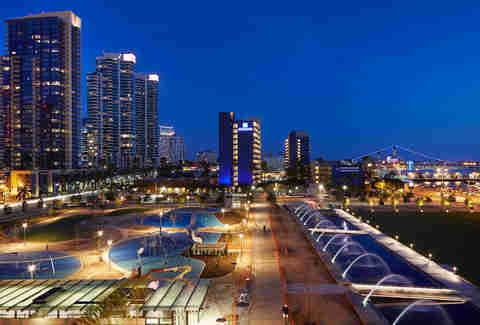 San Diego’s most ambitious park project since 1915 transformed the waterfront real estate surrounding the County Administration Center from a sea of parking lots into a $49.4 million, 12-acre park. 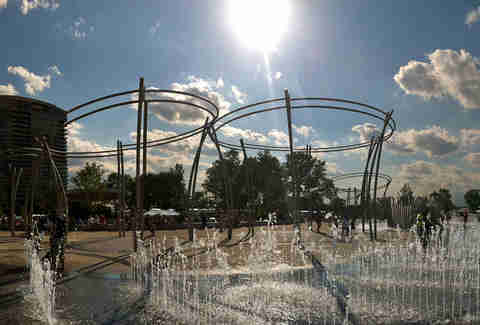 Take in views of the skyline from one of many grassy hills, or cool off by the 40-feet-wide, 830-feet-long giant fountain. It may be nicknamed “San Diego’s front porch,” but you’ll need a permit to crack that beer. Once a bunch of empty warehouses and industrial detritus, The Yards is now the 42-acre jewel in the Capitol Redevelopment neighborhood on the Anacostia River waterfront. A performance venue, park, and recreation facility, it has a bunch of cool places for would-be Frank Underwoods to reflect on their dastardly deeds/regrow their souls, like an elevated outlook, waterfall, and riverfront boardwalk. Its roster of events runs the gamut from Shakespeare and jazz festivals to concerts and wine tastings. 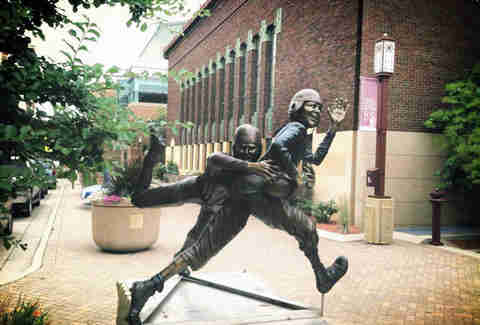 Mind-expanding culture and the great outdoors are not mutually exclusive, so who needs a stuffy museum when you can stroll past outdoor sculptures in Mankato? This year-round (for the very brave -- you saw Fargo, right?) exhibit features 32 one-year sculpture placements from around the world, which are eligible for sale, or awards and permanent installation by public vote. Guided group tours are available, or you can download a brochure and chin-stroke solo. What’s better than a slow-moving, sediment-laden river? How about 33 acres of green space, a 15,000-square-feet interactive fountain, and the country’s largest free outdoor climbing wall? 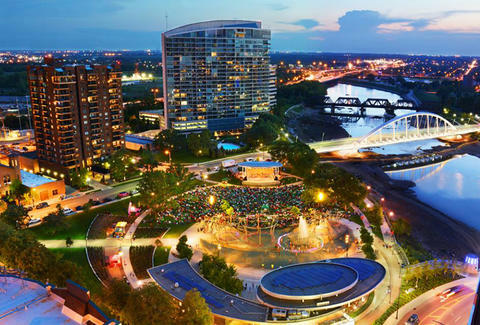 Columbus raised more than $40M in public and private investment to transform the downtown section of the Scioto River into an ecologically healthy urban oasis, complete with pedestrian boulevards, bike lanes, gardens, sculpture, and an amphitheater and event lawn. But back to that wall! It covers 6,100 square feet at Scioto Audubon Park and can accommodate up to 20 climbers at a time, from Spiderman levels of aptitude to complete butterfingers.